One of the many arresting features of the 2007-09 Great Financial Crisis and resulting equity bear market (and it was like a case of cardiac arrest in many ways) was how stock markets were laid waste by problems in US housing and the bond markets. In other words, advisers and clients with heavy equity exposure were blindsided by a downturn in different asset classes which looked entirely unrelated – until it turned out that they were not unrelated at all and a downturn in US housing roiled bonds, drained banks and markets of liquidity and all boats sank together (just as the rising tide of cheap money had lifted them all higher). Perhaps advisers and clients who are once more heavily exposed to equities may need to look beyond more obvious candidates – such as tariffs, trade wars, Brexit, Italy or rising interest rates – when stress-testing their portfolios, as one year ends and another comes on to the horizon. And if there is to be a surprise coming out of left field, perhaps it is the bond markets which could deliver a nasty blow, at least if recent price and yield action is any guide. Rising interest rates and tighter monetary policy (especially in the USA) could therefore exert a powerful influence, but they could do so via the fixed-income market, at least initially, if current trends continue. 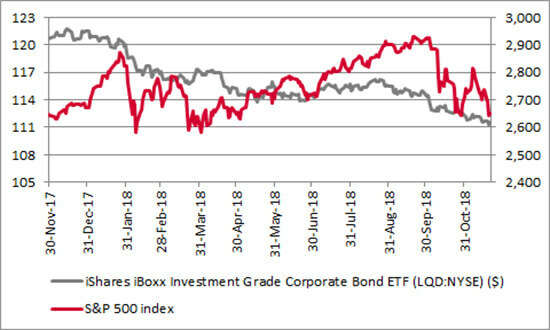 Thankfully that is still a matter of ‘if’ rather than ‘when’ but the seemingly inexorable slide in the price of the New York-listed iShares IBoxx Investment Grade Bond Exchange Traded Fund (ETF) must be followed closely for two reasons. First, this instrument, which trades under the ticker of LQD, peaked last December and has since lost 8% of its value. That might not sound a lot but it is when the yield bottomed at 3.21% when the price peaked, because the capital losses have eaten up a lot of income already. As advisers and clients know only too well, bond prices and yields move inversely, so when prices rise, then yields fall and vice-versa. Yields are now rising and so – even more pertinently – are credit spreads. At the time of writing, the aggregate yield available from the members of the basket of bonds that makes up the LQD ETF is 4.33%. That compares to 3.07% from US 10-year Treasuries so the premium yield – or spread – is 1.26%. That compares to the lows of barely 0.25% in early 2016, as the US Federal Reserve slowly embarked upon its mission to ‘normalise’ monetary policy and this year’s 0.72% low-point in January, as bonds and stocks basked in the perceived benefits of President Trump’s tax cuts. This gradual widening of the credit spread reflects Fed policy, and particularly the faster pace at which the central bank is withdrawing Quantitative Easing (QE). It may also reflect how US corporations have borrowed freely, enthused by record-low interest rates and cheap money. Research this summer from S&P Global revealed that US corporate debt has risen from $3.6 trillion to $6.3 trillion in the past five years alone. The good news is US firms have $2.1 trillion in cash on their balance sheets. The bad is that most of this liquidity sits with barely 25 firms. Strip those out and many investment-grade borrowers have a similar cash-to-debt ratio as ‘junk’, high-yield rated bond issuers, at around 21%. 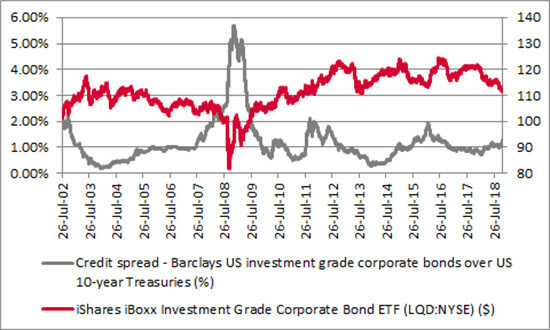 That statistic may explain why more than 40% of the total value of US corporate bonds were rated BBB for the first time ever this summer, according to S&P Global. Credit quality is slipping. Bond investors are paying attention because they are demanding higher coupons to compensate themselves for the risk (and a higher premium relative to Treasuries even as their yields rise). And equity market participants are paying attention too. Thankfully, spreads are moving higher at a slow pace. 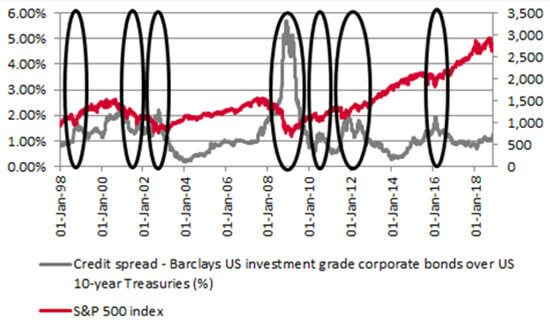 But advisers and clients will need little reminding that a sudden spike in credit spreads has been a harbinger of increased equity volatility, and even some nasty falls, on at least half-a-dozen occasions in the last 20 years. In addition, one equity strategy which had previously worked very well has started to encounter trouble – encouraging companies to carry out share buybacks. 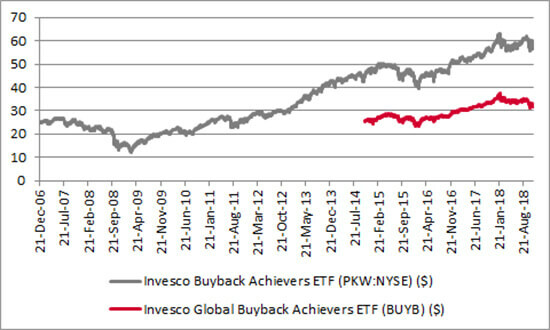 The US-listed Invesco Buyback Achievers ETF, which has the ticker of PKW, peaked in January and its more recently-issued UK-listed counterpart, Invesco Global Buyback Achievers ETF, with the ticker of BUYB, did the same and has since fallen by 13%. This is not to say that all share buybacks are bad. In theory firms with so much cash on their balance sheet that they can afford to give it back should be a good thing. But many of these firms have been using cheap debt to fund the buybacks and as debt gets more expensive that may look less smart, from the perspective of the holders of both the bonds and the equity.